Need move iTunes movies to an external hard drive. I would like to backup my iTunes videos on an external hard drive when I want to delete iTunes movies on my computer to save space on it. Asked by Damien at Apple Support Communities. If you have got a large iTunes library, it's crucial for you to backup all this content. iTunes users can also backup iTunes media library to save space on devices. As we all know, you can re-download some purchased content, like music videos, movies and TV Shows from the iTunes Store. But you can't re-download iTunes Rentals. To make sure you never lose any of iTunes content, you need to back up your iTunes media files regularly. iTunes allows you to backup your media library directly. However, you must restore your backup files from the external drive to your computer and you can't play these content on the PC directly. 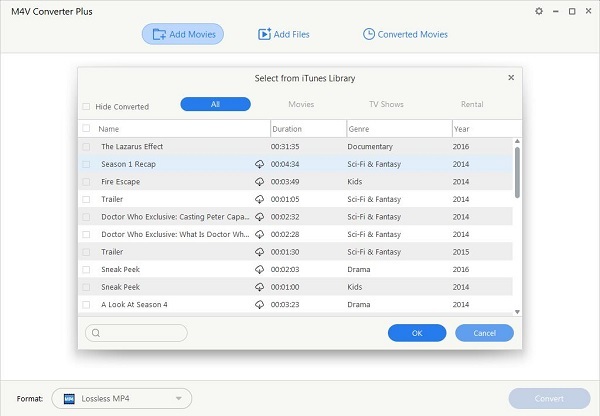 As we all know, movies, TV Shows and Rentals you got from iTunes, protected by Apple FairPlay digital rights management, are in M4V format that can be readily synced to a video-capable mobile device, such as Apple TV, or on your iPhone, iPad, or iPod touch. A single device can contain purchased content from up to five accounts, iTunes will not allow you to add data from a sixth account. If you rented the movie on your iOS device or Apple TV, you can't move it to any other device. If you don't start watching it within 30 days, you must rent it again. Movies you rent disappear from your iTunes library when the rental period ends. Thus, backuping iTunes movies to an external hard drive and playing those files directly are two main problems to be settled. As one of the best iTunes Movie Converter, M4V Converter Plus is widely recognized to solve all the problems above, you can't miss it. 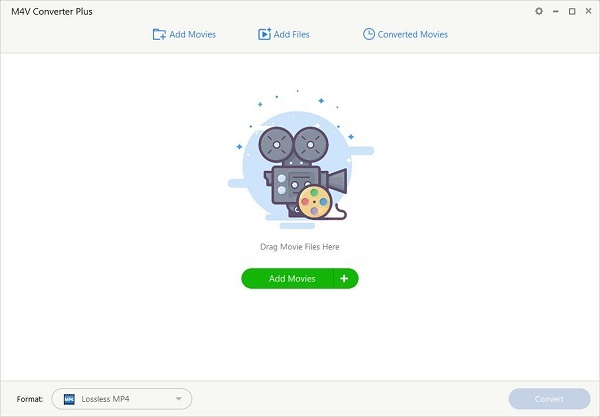 It is special designed to help users to remove FairPlay digital rights management from iTunes videos and convert protected M4V to almost popular plain video formats, including MOV, MP4, AVI, FLV, 3GP, etc. If necessary, you can also extract audio files from iTunes videos to save as WAV, MP3, M4A and so on. 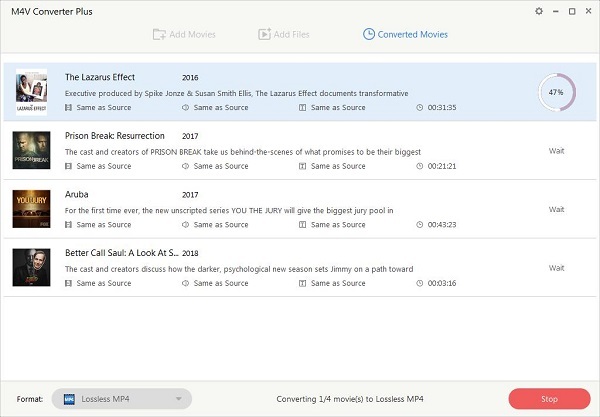 Moving (or just backing up) all iTunes movies may seem difficult, but it can be pretty fast with M4V Converter Plus for Win. With it, following are the cool things you can do. Remove FairPlay digital rights management from iTunes purchased movies, Rentals and TV Shows. Convert iTunes DRM M4V to the format can be played anywhere, like MP4, AVI, MOV, FLV, WMV, VOB, etc. It can extract audio from iTunes videos and save as MP3, AAC, M4A, M4R, WMA,etc. You can customize videos by trimming, cropping, change artwork and enable tracks before converting. Provide various presets, including iPhone/iPod/iPad, Galaxy Series, PS3, PS4, Smart HD TV and more. Fully compatible with Windows 7, Win 8 and Win 10 with the latest iTunes installed. Step 1. Free download M4V Converter Plus on your PC, install and open it. Step 2. Click Add Movies button to import iTunes videos to the program. It has an excellent batch conversion feature, allows you to convert multiple iTunes videos one by one with ease. Step 3. Choose the right output format from profile panel at the bottom of the window. 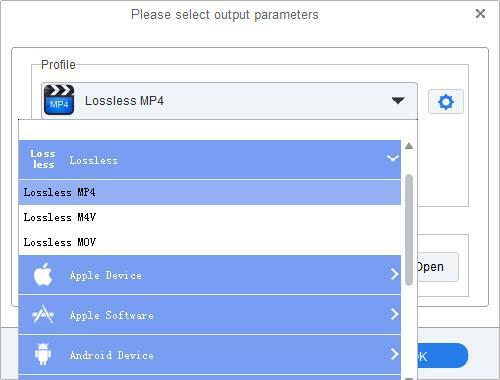 Here you can select default format "Lossless MP4". Click Profile blue panel again, then the program will start the iTunes movies to MP4 conversion automatically. Step 5. Backup iTunes movies to the hard drive. After conversion, your iTunes movies are ready to be backed up to the external hard drive. Just connect the external hard drive with your PC via the USB cable. The hard drive appears as a removable disk on the desktop. Drag and drop the converted iTunes movies to the hard drive directly. Now the iTunes movies on the drive can be seen and manipulated at will.